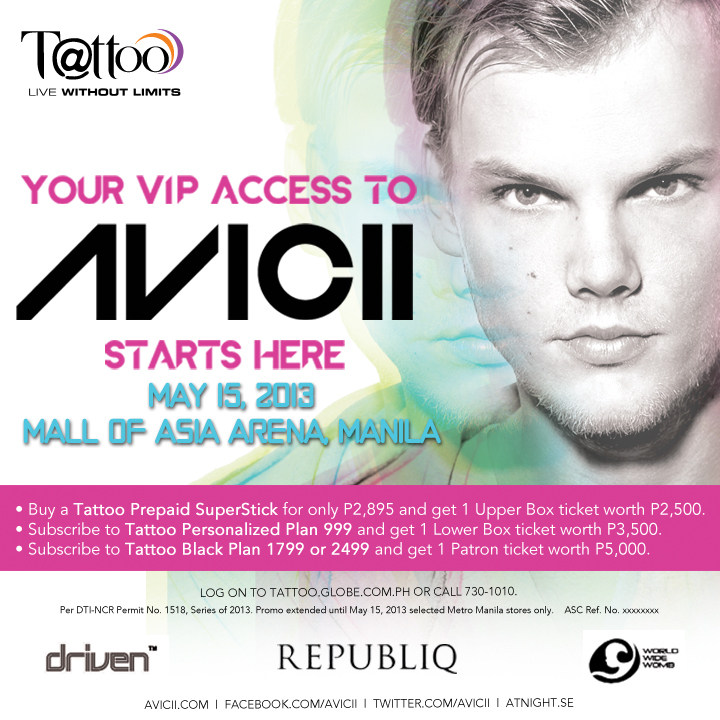 Tattoo Presents: Avicii for the Biggest Summer Party! Recently, my friend Dan and I have been talking about how a lot of our favorite DJs are coming to Manila this year. It's insane! I'm glad we are welcoming more and more electronic/EDM and house artists and DJs, one of which we will soon be seeing is AVICII! Although Avicii's concert has been moved to May 15, it's a-okay because Avicii is the-bomb-dot-com and the wait will be worth it! ;) You can read the official announcements made by the concert producers here, here, and here. 1. Buy a Tattoo 4G Prepaid Superstick (now only P2,895) & get a seat in the upper box. 2. Subscribe to a Tattoo Postpaid Plan 999 & get a guaranteed lower box seat. 3. Subscribe to a Tattoo Black Plan 2499 or 1799 & get the best seats in the house--yup, patron! I can't wait to dance and fist pump my way through the event as my Avicii favorites are spun. Levels, Fade Into Darkness, and I Could Be The One are only some of his music that I've come to love. Even more amazing, this 23-year-old DJ superstar is a 2x Grammy nominee. Props to him! Learn more about the offer at http://tattoo.globe.com.ph. So, let's bump into each other at the party, ya?